Maria Schneider strikes me as a highly intuitive composer. There is structure to her music, yet not; continuity yet never bound to any particular formal scheme; and most of her music has that unassailable feeling of sounding "right" for no other reason than she has willed it so and wanted it that way. Her muse is very much in the moment-when I listen to her compositions I am not really looking forward to what's down the line in the way that hearing Beethoven almost demands anticipatory suspense and final resolution. Of course, she is primarily a jazz musician, having formed her own big band/orchestra in 1993, and leads it like a conductor in front of a symphony orchestra. Jazz has its own rules, and though this album under review does confound the idea of labels as such, DOWNBEAT MAGAZINE doesn't give composer awards–as it has to her in three consecutive years from 2010-12–to purely "classical" composers. So we do need to start with a frame of reference. Her originality in the field has managed to stretch the confines of jazz into something new without resorting to the avant-garde. Years ago people like Anthony Braxton, Miles Davis, John Coltrane, and Ornette Coleman were breaking all sorts of barriers in imitation of the classical composers before them who had also considered their art form to be running into a dead end. The thing is, no one, aside from some real diehard fans, listened; and in the meanwhile people like Chick Corea moved into the rock genre sound-wise and attracted new audiences. Today we look at the work of Coleman at al with a lot more sympathy the same way the Schoenberg's music has, in many ways, become familiar, accepted, and even loved in some quarters. But those days are gone, and the radicals cannot be returned to. So what is a jazz composer to do? One answer is to simply move backwards the way an artist like Wynton Marsalis has, playing the oldies, or the imitation oldies with unalloyed perfection. Another seems to be the road Schneider has taken, incorporating innate musicality comprised of her entire musical experiences since a child, and not fearing to tread onto new turf. This isn't new; even here people like Duke Ellington and Stan Kenton were paving the way before Schneider was born, and I would be startled to hear if those two didn't have an influence on her. But when I listen to a piece like her GRAMMY-winning "Cerulean Skies" I am hearing jazz, Copland, folk structures, sentimentality, pessimism, optimism, and a feeling that most of all reminds me of Roy Harris in his curious ability to project the fears and hopes of the American land in a way that few others could. But on this album, we move away from jazz, almost completely, or at least no further into it than many other American and European composers hearkening only to hints and surface similarities, despite the presence of improvisation, which classical music actually claims first rights to anyway. And when one has Dawn Upshaw at her disposal, it's no easy turn to "not" write directly for a voice as versatile and spectacular as hers. So we have two song cycles, both similar and superb music, thought "Winter Morning Walks" may be a masterpiece, with "Carlos Drummond de Andrade Stories" gently nipping at its heels. And who is Carlos Drummond de Andrade? One of Brazil's top poets, discovered by Schneider a long time ago as she has an affinity for that country, yet brought home during her first visit 15 years ago. This performance is dedicated to her father, who evidently loved the piece and hoped to hear more; he would not, though more was forthcoming. And it appeared int he guise of "Winter Morning Walks." These poems, just nine out of what poet Ted Kooser says are hundreds, and succinct and pithy in content. He began writing them when recovering from cancer surgery and having to stay out of the sun. His many morning walks inspired him to finally start reading and writing abain, and he put these small vignettes on a postcard and sent them to a friend, one by one. 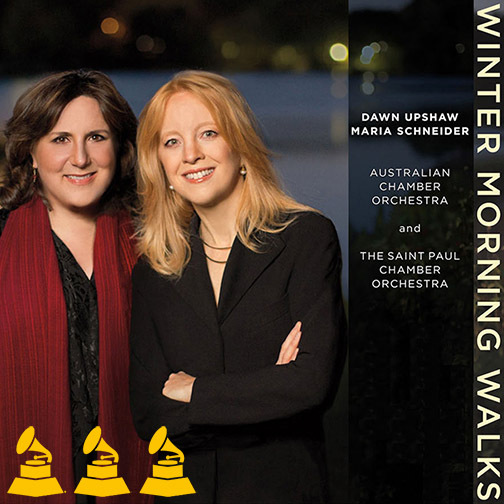 Schneider's music perfectly captures the mood of these writings, and is supplanted by Dawn Upshaw's radiant singing, almost ecstatic utterances that give primary and forceful precedence to the melodic line, while a lot of the movement of the music actually occurs way underneath in the orchestra. It's a great concept and a highly sophisticated and moving sound. Watching a few YouTube videos of Schneider being interviewed show her to be a very unassuming composer, even anti-intellectual in the way she approaches her art. In other words, despite the complexity of much of the music, there is far more heart than head in this artist's oeuvre. Both the chamber orchestra, highly regarded each, play beautifully, and one can only hope that this marks a beginning of Schneider's entrance into even more orchestral music in the future. She is an important composer for sure, and I regard this album as the most important set of song cycles since Andre Previn's "honey and Rue" and Peter Lieberson's "Neruda Songs"–and that is exceptionally high praise.